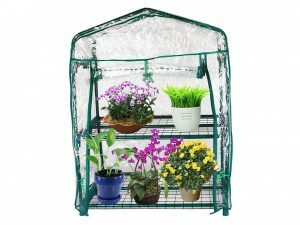 - Ideal for small backyards or homes where space is an issue; place on a deck, patio, or balcony. - Gives seeds, seedlings, and young plants an early start. - Clear polyethylene cover and roll-up zippered door for easy access. - 27" Long x 18" Wide x 33" High.